If you’re thinking about getting a chinchilla, you’re probably wondering what the right chinchilla cage size is and whether or not it’s better to get a wire, plastic, or wooden chinchilla cage. There are so many things to think about when getting a pet which is why we did the research to find the best cages out there to help you find the right one. Before we get started, let’s take a look at some of the features to keep in mind. 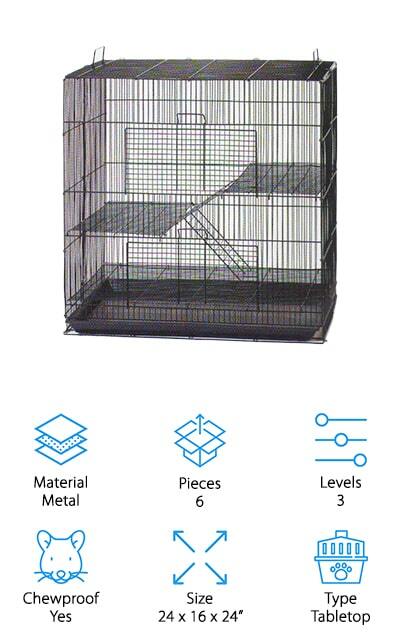 Material: When it comes to this kind of cages, there are 2 different materials: metal and plastic. Of the products we chose, some are made completely of metal while others have a plastic bottom and ramps and a wire top for ventilation. Pieces: To get this number, we included the top of the cage, base of the cage, ramps, balconies, and any wheels that are included. We also added in any accessories, like water bottles, food dishes, wheels, or houses. Levels: Chinchillas like a lot of room to move around so it’s important to make sure they have a lot of space to explore. That’s why all of our picks have at least 2 levels. Some have as many as 6! Chewproof: Having a chew-proof cage is important when you have a chinchilla because they like to chew on everything. This gives wire cages a bit of an edge because they’re usually much harder to chew through than plastic. Size: Pay special attention to the size. 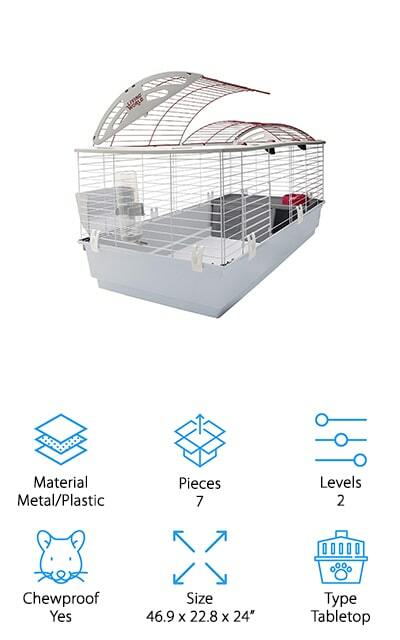 This will let you know whether or not you have room for the cage in your home and also gives you a better idea of how much space your chinchilla will actually have. Type: Some of these cages are designed to stand independently. They’re usually very tall and equipped with wheels so they’re easy to move around. Smaller cages are made to sit on tabletops and don’t take up quite as much space. Now that you know a little more about chinchilla cages, let’s move on to our top picks. If you’re in a hurry, make sure to check out our top and budget picks. They’re the best way to get an idea of the range that’s available so we make them easy to find. They’re right at the top of our list. Stick around if you can, all of these products are great. So, which chinchilla cage is the best? Let’s find out. 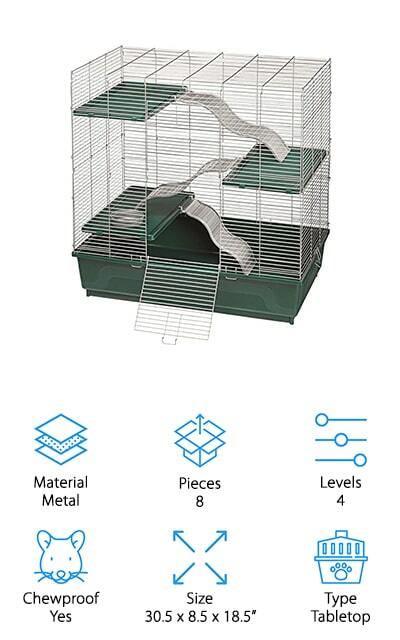 If you’re looking for a Critter Nation chinchilla cage, you’re in luck because their Midwest Deluxe is our top pick. This cage includes 2 pans, 2 adjustable shelves, 3 ramps with covers, and 4 locking casters for easy maneuverability. The pans are leak-proof to keep messes contained and the wire bars are spaced so your pet can climb and explore while also staying safe. This cage also features 2 full, wide double doors with pet-proof locks so you get easy access while your pets won’t be able to escape. Plus, all of the internal shelves are removable which makes cleaning and feeding quick and simple. A great thing about this brand is there are a lot of accessories available to customize your pet’s space and this cage has attaching points for tubes, toys, and hammocks. Next up is our budget pick, the Prevue Pet Small Animal Home. The large base offers plenty of room for exercise and accessories to help your pet stay active and healthy and, at 6.25”, it’s deep enough that you generally don’t have to worry about messes making their way onto the floor. There are 2 large doors, one on the top and one on the side, plenty of access for cleaning and feeding. The wires are tightly spaced with rounded corners so there are no pinch points where your pet can get hurt. It also includes a platform and ramp to set up the second level for your chinchilla to explore. This lightweight, tabletop-style cage is a decent size and still very lightweight for easy handling if you do have to move it. For a really awesome extra large chinchilla cage, check out this one from Living World. It has an upper wire frame and a plastic base for a safe, well-ventilated space for your pet. You also get a balcony with ramp access, a tip-proof food dish, water bottle, and hay guard. The water bottle and hay guard are accessed from the outside of the cage so it’s easier for you when it’s time to clean or refill. Another great thing about this cage it the style. White wire sides and arched red wire top give a stylish look that makes it stand out a bit from the competition. Assembly is really easy, too. It’s held together using simple but durable plastic clips and there are no tools required. 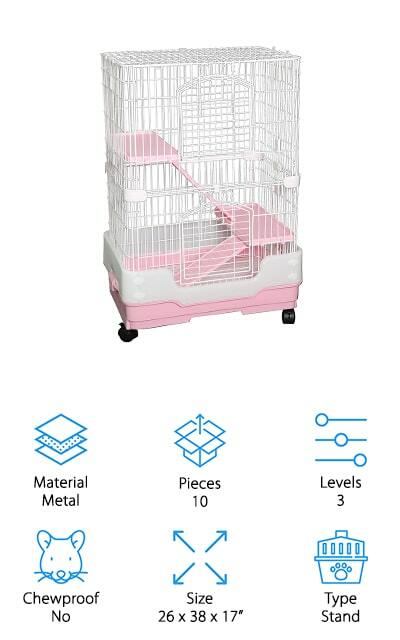 This Kaytee chinchilla cage is the perfect size for a chinchilla and gives them a lot of levels to explore. First, there’s a deep 8.5-inch deep base pan which not only gives your pet a large space to run around in, it also prevents bedding and litter from spilling out of the cage onto the floor. There are 3 different balcony levels, too, each connected by a wavy, plastic ramp. All of the wires and locks are chew-proof and there are 2 large doors for easy access and cleaning. Assembly is really easy, too. The cage snaps together in minutes and there are no tools required. Note that the wire spacing is a ½-inch which is great for larger pets like a chinchilla but this would not be a good cage for a smaller animal. The Yaheetech Small Animals Hutch is a perfect choice if you want something that has an exceptional amount of vertical space. It has an iron frame and a gorgeous hammertone finish which makes it a nice addition to your family room. You can even keep it outdoors because the painted iron is rust and wear resistant. In all, it contains 5 shelves, 5 ramps, a slide-out tray for easy cleaning, an 8.5-ounce water bottle, and a plastic food tray. Casters make it easy to move around so you can easily get it out of the way when it’s time to sweep or vacuum the floor. 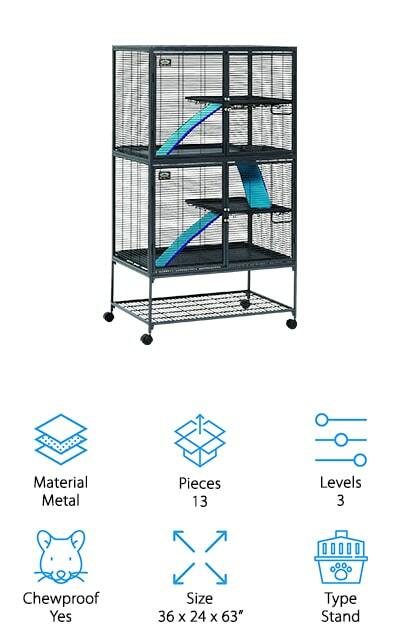 And get this, there are 3 oversized doors along the front of the cage to quickly and easily access any level for cleaning or when it’s time to play with your pet. 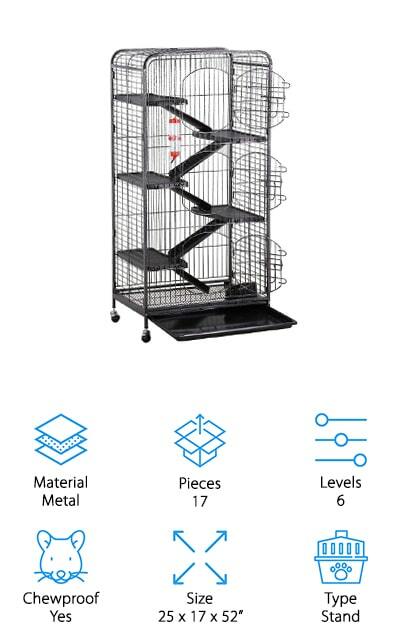 The Prevue Pet Products Cage is a great choice for a cheap chinchilla cage that’s loaded with features. 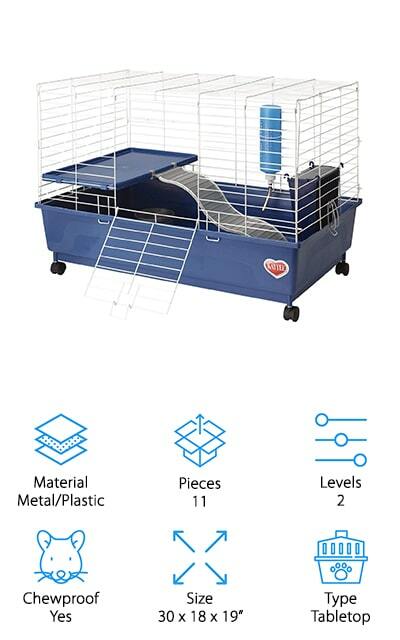 With a deep base for activity and 2 different balcony levels, this cage gives your chinchilla a lot of areas to explore. That’s not all, it also includes a wheel for more intense exercise and a small house where your pet can hide when it’s ready to sleep or just wants a place to hide. The top opening door gives you easy access for cleaning and guarantees that your pet won’t escape. Cleanup is easy, too, thanks to the removable tray and bottom grille. This is a tall tabletop cage that provides more vertical space than most of the other tabletop options we researched. It’s available in a few fun colors, too, including mint green, pink, light blue, and light yellow. While we wouldn’t call the Ferplast Small Pet Cage a small chinchilla cage, the size is definitely a little deceiving. 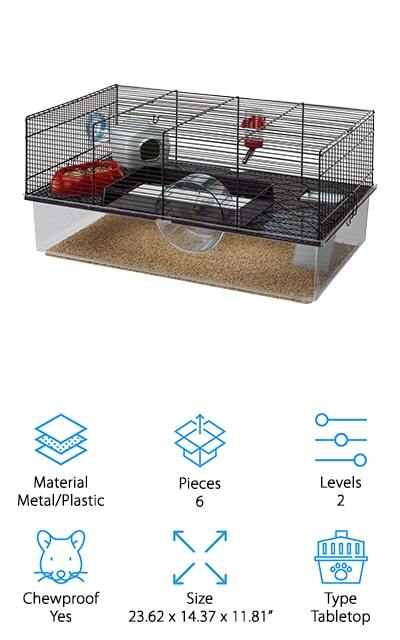 The truth is that this cage has a double floor structure which actually gives your pet a lot more living space than any other cage of this size. It has a large, deep, plastic base that’s essentially the “basement” of this pet home. The first-floor surface is made of durable plastic and features a large cutout in the center that holds a wheel. Other accessories include a water bottle, house, and feeding dish. Another great thing about this cage is that it’s modular which means you can add onto it if necessary. 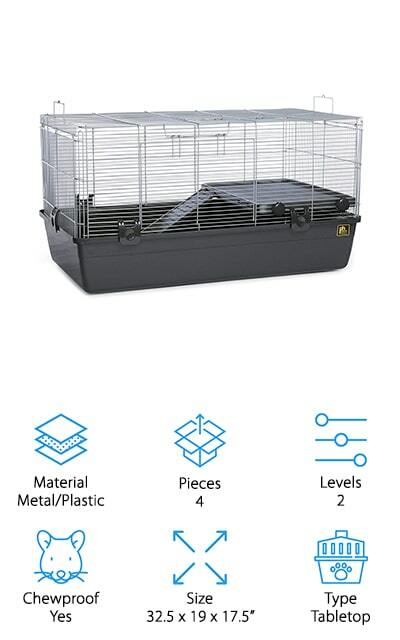 The wire mesh top provides appropriate ventilation and has an easy-access top door so you can reach into the cage without worrying about your pet escaping. 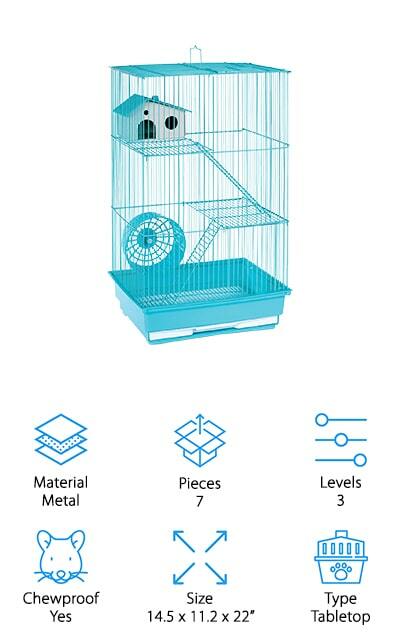 This cage from Mcage is a spacious tabletop home that your chinchilla will love. There 3 different levels including a ground floor and 2 ramp-accessible different balconies. While the floor is made of metal wire, you can easily remove it and use the pan as the bottom of the cage if you’re worried about hurting your pet’s feet. The material is also chew-proof and covered with an animal-safe epoxy to protect your curious pet. There are 2 large front doors, one on each level, so you can easily get to your pet no matter where it is in the cage. The top of this cage has 2 easy-to-carry handles that make it easy to move from place to place or just to move it to the sink when it’s time for a good cleaning. Here’s another great cage from Kaytee. The 2-level My First Home habitat has a deep plastic base and a wire top for appropriate ventilation and a clear view of your pet. There’s also a balcony with ramp access that creates a nice little nook underneath it where your pet can hide when they need some alone time. The large front access door has a secure latch to prevent your chinchilla from escaping and allows easy access for you when it’s time to clean, refill food, or when you want to give your pet some lovin’. This cage is loaded with accessories, too. It includes a food dish, water bottle, caster wheels, balcony, and a safety ramp. If you love this cage but were looking for something a little bigger, you’re in luck. There’s a larger size available, too. Our last pick for best chinchilla cage for sale is the Homey Pet Small Animal Crate. This is a tall tabletop cage that features a large base and 2 balcony levels to give your chinchilla a lot of room to explore. There’s also a urine guard at the bottom that separates your pet from the pull-out tray and helps keep your floors clean. The trays and ramp are made of chew-proof plastic as is the bottom tray while the top is made of white metal wire that has a non-toxic powder-coated finish that keeps your pet safe and prevents the metal from rusting or corroding. If you’re looking for a stand-style cage that will fit into your budget, this one is a good choice. Plus, it’s available in 3 different colors: blue, pink, and brown.